Among the greatest foreign-policy dilemmas faced by former President Jimmy Carter is one that has never been publicly aired but is gaining new relevance. It concerns nuclear war, and how the U.S. government would survive it. Carter’s decisions remain classified, but documents newly declassified by the CIA, along with the archives at several presidential libraries, provide a new window into the White House’s preparations for an imminent apocalypse. Even as the government marked Digital India Day, encouraging more Indians to move to banking online, investigators and cyber security agencies are battling more breaches of banking transfer security, admitting that “non-state” actors are increasingly targeting India. It’s almost night and day, observes Manjeet Pardesi. In the mid–twentieth century, Prime Minister Jawaharlal Nehru called for the removal of all foreign militaries from Asia. Now, India openly welcomes America’s presence in the South Asia/Indian Ocean region. In fact, the two nations have agreed to access each other’s military facilities, continue their robust bilateral military exercises, and more. In this article, Pardesi highlights the factors that pushed both countries in this new, collaborative direction. This article was originally published by the East-West Center (EWC) in March 2017. As China asserts itself economically and militarily, the United States is faced with maintaining a balance of power in East Asia and safe-guarding its global dominance. In contrast to its competitive position with China, the US relationship with India--projected to be the third-largest economy by 2030--is set on a more collaborative course. American support for a rising India aligns with its broader security and strategic goals. India, for its part, remains intent on achieving a position of regional primacy, but welcomes the US presence in the South Asia/Indian Ocean region. The two nations, for example, have signed an agreement giving each other access to military facilities, and they conduct many bilateral military exercises. These developments are a far cry from the mid-twentieth century, when Jawaharlal Nehru called for the removal of all foreign militaries from Asia. What factors pushed the India-US relationship in this new direction? And what shared interests and goals does the partnership reinforce? In any given year, a handful of companies file for Chapter 11 bankruptcy in the United States. Rarely, however, does one of these filings reverberate beyond the boardroom and into the realm of geopolitics. Those that do — Lehman Brothers in 2008, or several U.S. automakers in 2008-10 — usually involve hundreds of billions of dollars. But the next big geopolitically relevant bankruptcy may be on the horizon, and the amount of money involved is tiny next to the collapses of the past decade. On March 29, Westinghouse Electric Co., a subsidiary of Japanese conglomerate Toshiba, filed for bankruptcy. The U.S.-based nuclear power company has been building two state-of-the-art nuclear power plants in Georgia and South Carolina, but it has been plagued by delays and cost overruns. The filing sent Toshiba scrambling to cut its losses by March 31, the end of Japan's fiscal year. The Japanese conglomerate ended up writing down over $6 billion on its nuclear reactor business. But Toshiba's troubles don't end there; the firm is also working to sell off a portion of its chip manufacturing holdings. But Indian information technology workers might do better without the companies that held them back, says Mihir S Sharma. Let’s give President Donald Trump the benefit of the doubt, and assume that he genuinely believes that he was elected to protect American workers. He did promise on the campaign trail to “direct the Department of Labour to investigate all abuses of visa programmes that undercut the American worker”. But even if that were the stated motivation behind the changes his administration rolled out to the work visa programme recently, their effect is to help American companies, instead. Three major alterations were made to the H-1B visa system by the United States Citizenship and Immigration Services, or USCIS. It said it would make more “targeted” visits to companies that hire workers on H-1B visas. It would focus on cases where the companies were difficult to validate; where there was a high ratio of H-1B to “regular” workers; and, finally, places where H-1Bs worked “offsite at another company or organisation’s location”. Meanwhile, the US Department of Justice issued a “caution” to companies seeking H-1B visas to “not discriminate against US workers”. It threatened to “investigate and vigorously prosecute” claims that US workers were disadvantaged by companies that had applied for H-1B visas. A third US government agency, the Department of Labour, is similarly energised; its head promised during his confirmation hearings to investigate any layoffs that “result” from H-1B visas being granted. This may not, of course, be as much a product of Mr Trump’s own instincts - to the extent he has any in this domain - as the long-held beliefs of some of his appointees. The man Mr Trump set to head the Department of Justice, for example, Attorney General Jeff Sessions, has had a long history of attacking work visa programmes. The U.S. military’s decision to drop its largest conventional weapon Thursday on positions held by the Islamic State group (ISIS) in Afghanistan came as a surprise to many who noted that the jihadists had only managed to instigate a low-level insurgency in the Central Asian nation. While the huge, costly blast may have sent a message about President Donald Trump’s willingness to use extreme measures against his opponents, one of America’s biggest bombs may have missed the true target. The U.S. Air Force dropped an 11-ton explosive, known as the “mother of all bombs” or Massive Ordinance Air Blast (MOAB), on a system of caves and tunnels previously identified as a known hub for ISIS activity in Afghanistan’s restive Nangahar province. The 30-foot-long, $16 million bomb was capable of causing a nearly 500-foot blast radius and Thursday’s attack killed an estimated 36 militants loyal to the ISIS. Trump lauded the mission, which appeared to be authorized directly by the military, as “another very, very successful mission.” Elsewhere in Afghanistan, however, another hardline Sunni Muslim group, the Taliban, has been regrouping. “The Taliban have good reason to believe they’re winning,” Marvin Weinbaum, former State Department analyst for Afghanistan and Pakistan and resident scholar at the Middle East Institute, told Newsweek. This report takes stock of Chinese military analysts' recent thinking on escalation control in crisis or conflict situations. To do the topic justice, the text approaches it from various angles, including how escalation control might fare in limited wars, space and cyberspace operations, and nuclear deterrence. One obvious take-away from the review is that Chinese thinkers now treat crisis and war control with a seriousness and depth that had been missing in previous discussions of the topics. Given China’s past espionage in cyberspace, its move from economic theft towards militarization in the virtual domain represents a pivot that Washington could regard as threatening. While issues of trade and North Korea are likely to consume much of the discussion during this week's summit between Chinese President Xi Jinping and President Donald Trump, the growth of cyberspace as a battlefield domain could also be a point of focus. What is China’s history in cyberspace in relation to the United States, and what has led to this change in policy? China, like other great powers since at least the 16th century, tends to believe that the major task of its economic statecraft is to translate its national wealth into the exercise of power. How will Xi Jinping’s emerging economic statecraft differ from other recent Chinese leaders? 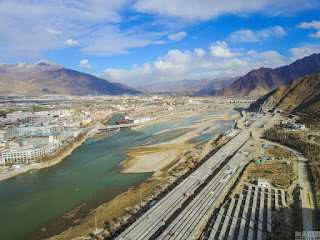 ** Dual infrastructure in Tibet: a threatening scenario for India? He helped Bose who was seeking help from Germany and Japan to free India escape from the country via Kabul, and that was all even Bose knew of this man, who in reality was betraying Bose to the British. Bhagat Ram Talwar, the only quintuple spy of World War II, whose spymaster Peter Fleming gave him the code name Silver, was spying for Britain, Italy, Germany, Japan and the USSR, all at the same time without any of them having a whiff of it. While the best of spies with all their skill stayed put in one city, this deceptive Pathan shuttled between Kabul and India, 24 times, that too on foot. Mihir Bose’s The Indian Spy, the true story of the most remarkable secret agents of the World War II, recounts all of the life of this mastermind, who managed to deceive almost everybody, yet remain unscathed. Some of the characters one comes across in the excerpt below which talks of how Talwar took the Nazi’s for a ride are, Uttam Chand , Talwars’ former jail mate in Peshawar who had moved to and set up a shop in Kabul and helped him hide Bose by hosting him in his own house, and Carl Rudolf Rasmuss, a member of the German Diplomatic Club and former German Trade Commissioner in Calcutta. During Silver’s absence from Kabul, Uttam Chand had become more involved with the foreign powers there. Rasmuss had asked his help in getting hold of gold sovereigns—Shankar Das, the Indian merchant helping the Italians, could not obtain enough—to pay bribes to Afghan officials and also the tribal leaders, and soon Uttam Chand was buying some 2,000 gold sovereigns 1 as well as Indian currency for the Germans from various brokers in Kabul. 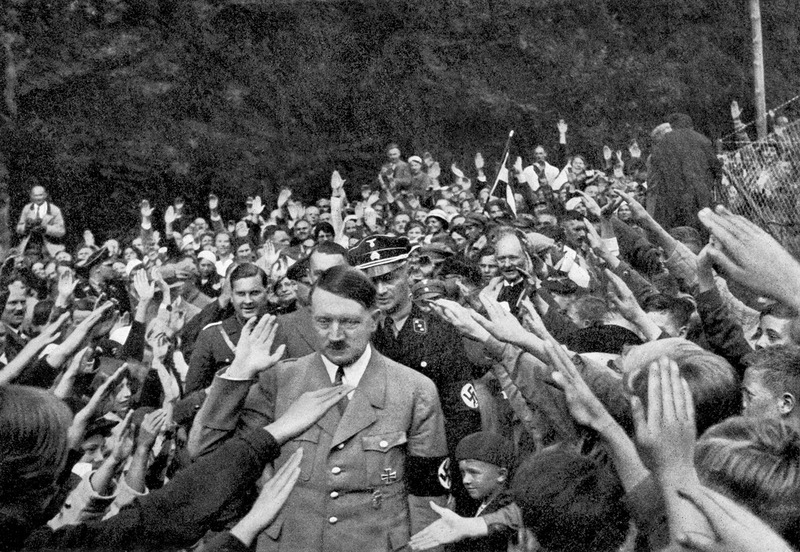 He also took to visiting the Russian Minister telling him more about Bose and Silver, passing on various titbits of information about how the Japanese were trying to bribe Afghan officials, and how the Kirti party was not happy about Silver maintaining relations with the Axis powers. The horrifying rate of arms modernization in Russia and China poses a formidable challenge to the U.S. military. The U.S. has enjoyed global military superiority since the collapse of the Soviet Union in the early 1990s. Moscow and Beijing, which are rapidly growing their military might by the day, are now officially a major threat to the U.S. military, the U.S.-China Economic and Security Review Commission has concluded. U.S. naval, air, land and space capabilities have been unmatched since the end of the Cold War, but not anymore. Beijing and Moscow are inching closer to developing a strategic military advantages over the Pentagon. While it has taken Washington decades to build certain defense technologies, Beijing and Moscow have made enviable advances in multiple areas – such as air defense, stealth fighters and advanced long-range air-to-air missiles – much faster than the Pentagon predicted. Russia and China outsmart the U.S. Despite the horrifying and rapid rate of weapons modernization in Russia and China, the U.S. still outspends both on defense. The Pentagon’s military budget stands at about $600 billion, which is about three times more than China’s defense budget and more than six times more than Russia’s. The practice of disinformation is a key example of such “measures”. It could involve stories planted in foreign outlets - essentially “fake news” that would present “an alluring amalgam of fact and fantasy—much of it unverifiable—designed to confuse readers and shift political discussions,” explains Schindler. What is Russia really up to in Ukraine? That was the question addressed during a recent event at West Point by Dr. Phillip Karber, president of the Potomac Foundation. Dr. Karber spoke to cadets and faculty about current Russian operations, the Kremlin’s ultimate objectives, and the implications for the United States of the ongoing conflict in Ukraine. His observations are based on twenty-five trips to the region, including 177 days spent with Ukrainian forces on the front lines. Karber avoids the term “hybrid warfare” to describe Russian actions, he says, because it connotes only a narrow part of a much broader spectrum of what Russia itself calls “New Generation Warfare.” Despite Russia’s label, though, the components of the concept are not entirely new. In fact, Karber argues that the current war has striking parallels with past conflicts, most notably the 1973 Arab-Israeli War, which he studied shortly after that war’s conclusion as part of a US “lessons learned” team let by Brig. Gen. Donn Starry. He also identifies several factors that combined to create the conditions for Russia to develop the strategy it is currently implementing. First, Karber points to weaknesses caused by the post-Cold War demobilization and loss of forces associated with the Soviet Union’s breakup; in some cases, three Soviet divisions were condensed into a single modern brigade, a force structure change that ultimately required Russian military planners to dramatically alter the way Russia would employ its forces. Second, Karber cites the 1990s Chechen wars, in which for the first time, conscripts were deliberately held back from direct action. This professionalized “tip of the spear” dynamic is playing out similarly today in Ukraine, where conscripts are often left in garrison while the remainder of combat units rotate into Ukraine. Washington’s two recent big summits occurred as if they were in two different worlds. First, President Donald Trump met Chinese President Xi Jinping at Mar-a-Lago, where the two leaders’ conversation focused on trade and North Korea. Then, Secretary of State Rex Tillerson visited Moscow, where he and Russian Foreign Minister Sergei Lavrov traded allegations over the chemical weapons attack in Syria. The two summits were linked by concern about hotspots like Syria and North Korea, yet not by a unified strategy. But so long as it fails to see Russia in an Asian context, Washington will struggle to develop a coherent approach. America’s friends and allies in Asia, by contrast, realize that U.S. policy toward Russia and Europe and the Middle East shapes Chinese diplomacy. Since annexing Crimea in 2014 and launching a confrontation with the West, Russia has tacked toward China to avoid complete diplomatic isolation. This has strengthened Beijing’s hand in Asia, for example, by reducing Moscow’s ability to adopt positions which contradict China’s priorities. The U.S. summits in Mar-a-Lago and Moscow, therefore, were watched with great interest in Asia. For example, Japanese Prime Minister Shinzo Abe is pursuing a strategy of improving ties with Russia to ensure Moscow does not align too closely with Beijing. To Japan, it makes no sense to look at relations with Russia and with China in isolation. Japan has promised significant business, energy, and infrastructure investments in Russia. As a result, stalled talks on territorial disputes with Russia — the biggest impediment to full rapprochement — have been resuscitated. FILE - Afghan security forces take a position during a gunbattle with Taliban forces in Laghman province, Afghanistan, March 1, 2017. As the United States and Russia clash on Syria, another war-torn nation could play out as a renewed theater for the U.S.-Russia rivalry: Afghanistan. 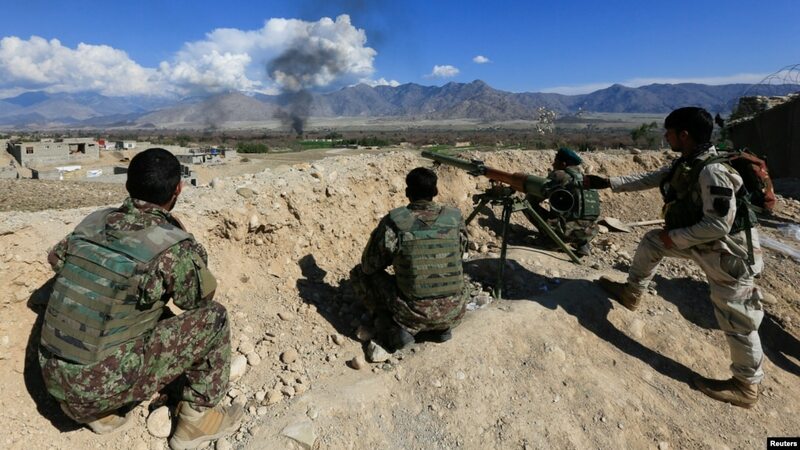 Thursday, U.S. forces dropped what was being called the largest non-nuclear bomb on a reported Islamic State militant complex in the eastern Afghan province of Nangarhar. The U.S. strike came a day before Russia is to host multi-nation talks on prospects for Afghan security and national reconciliation, the third such round since December. Eleven countries are set to take part in Friday's discussions in Moscow, including Afghanistan, China, Iran, Pakistan and India. Former Soviet Central Asian states have been invited to attend for the first time. The Afghan Taliban said Thursday that they would not take part. 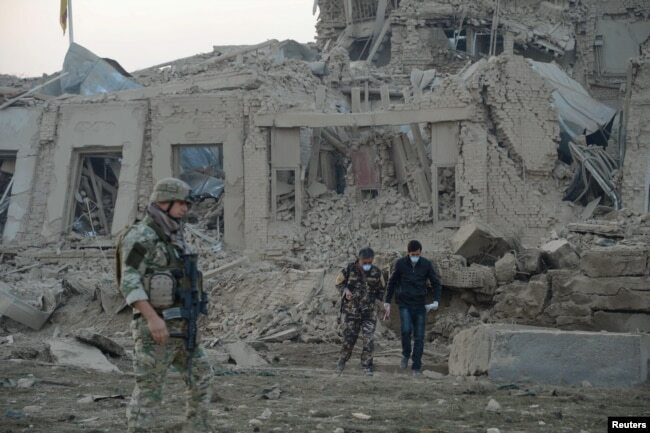 "We cannot call these negotiations [in Moscow] as a dialogue for the restoration of peace in Afghanistan," Taliban spokesman Zabihullah Mujahid told VOA. "This meeting stems from political agendas of the countries who are organizing it. This has really nothing to do with us, nor do we support it." The spokesman reiterated insurgents' traditional stance that U.S.-led foreign troops would have to leave Afghanistan before any conflict resolution talks could be initiated. The United States was also invited to the Moscow talks, but Washington declined, saying it had not been informed of the agenda beforehand and was unclear about the meeting's motives. FILE - Afghan security forces and NATO troops investigate at the site of an explosion near the German consulate in Mazar-i-Sharif, Afghanistan, Nov. 11, 2016. American military officials suspect Russia's so-called Afghan peace diplomacy is aimed at undermining NATO and have accused Moscow of arming the Taliban. "I think it is fair to assume they may be providing some sort of support to [the Taliban], in terms of weapons or other things that may be there," U.S. Central Command Chief General Joseph Votel told members of the House Armed Services Committee in March. He said he thought Russia was "attempting to be an influential party in this part of the world." For its part, Moscow has denied that it is supporting the Afghan Taliban. "These fabrications are designed, as we have repeatedly underlined, to justify the failure of the U.S. military and politicians in the Afghan campaign.There is no other explanation," said Zamir Kabulov, the Kremlin's special envoy to Afghanistan. In a separate statement Thursday, the Taliban also denied receiving military aid from Russia, though the group defended "political understanding" with Afghanistan's neighbors and regional countries. Anna Borshchevskaya of the Washington Institute for Near East Policy said reports of Moscow supporting the Taliban were not new. "The official Russian position on the Taliban is that they see it as a group that could help fight ISIS, but this is something that even some Taliban spokesmen have denied, since ISIS and the Taliban reached an understanding about a year ago," Borshchevskaya said. FILE - Russian President Vladimir Putin gestures during his annual news conference in Moscow, Russia, Dec. 23, 2016. 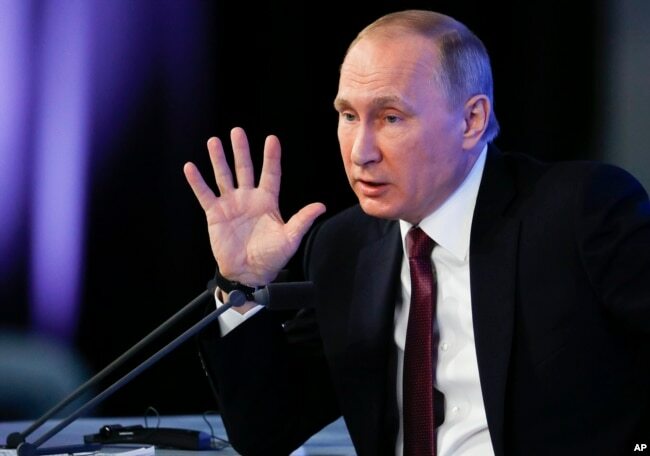 She said that if the allegations of Russian support for the Taliban were true, Russian President Vladimir Putin was most likely motivated by his desire to undermine the West. "Certainly one motivation could be taking advantage of regional chaos, and to assert Russia's influence at the expense of the U.S., taking advantage of a U.S. retreat from the Middle East and elsewhere and [to] undermine NATO and the U.S." Borshchevskaya said, "This has been Putin's pattern." U.S. President Donald Trump has made few public statements on Afghanistan, and his administration is still weighing whether to deploy more American troops to try to reverse the course of the war. Thursday's strike in Nangarhar marked a major step by the Trump administration in Afghanistan, in which there has been a U.S. military presence since 2001. During a March 31 NATO foreign ministers meeting in Brussels, U.S. Secretary of State Rex Tillerson reaffirmed U.S. support for the alliance's mission in Afghanistan. "NATO's work in Afghanistan remains critical. The United States is committed to the Resolute Support Mission and to our support for Afghan forces," Tillerson said. Some 13,000 NATO troops, including 8,400 Americans, are part of the support mission, tasked with training Afghanistan's 300,000-member national security and defense forces. Michael Kugelman, South Asia expert at the Washington-based Woodrow Wilson Center, said he expected continuity in U.S. policy toward Afghanistan between the Obama and Trump administrations. "The statement made by Tillerson at a recent NATO meeting could well have been uttered by an Obama official," Kugelman said. "The focus on training, advising and assisting and the call for reconciliation mirror exactly the Obama administration's priorities." 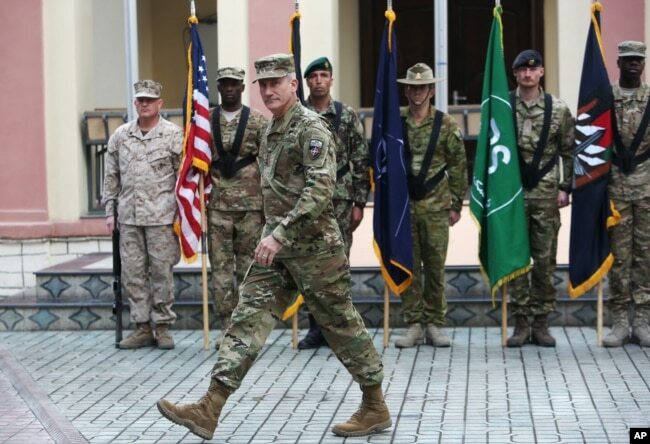 FILE - U.S. Army General John Nicholson Campbell, commander of Resolute Support forces and U.S. forces in Afghanistan, takes the reins in a change-of-command ceremony in Kabul, March 2, 2016. But the South Asia analyst noted one important policy difference: U.S. troop levels in Afghanistan. "Obama was an anti-war president who was never comfortable keeping large numbers of troops in Afghanistan. Trump is unlikely to be as constrained," Kugelman said. "Look for Trump to send in several thousand more troops," he said. "This is a request that the generals in Afghanistan have made for years, and Trump is more likely to defer to the U.S. military's wishes on this than Obama was." As for Russian involvement in Afghanistan following the former Soviet Union's occupation of the South Asian country from 1979 to 1989, Kugelman said that even if Russia were engaging the Taliban to undercut U.S. influence, the two nations ultimately hope for the same outcome in Afghanistan. "The ironic thing is that Washington and Moscow both want the same endgame in Afghanistan — an end to the war, preferably through a reconciliation process — but they simply can't get on the same page about how to proceed," Kugelman said. Julian Ryall in Tokyo, Nicola Smith in Seoul, and David Milward in the United States, have an article in today’s, The Telegraph, (April 16, 2017), with the title above. They write that the North Korean missile test failure this weekend may have been due to a U.S. cyber hack. As we know now, North Korea’s missile test went spectacularly wrong quickly, as Pyongyang’s missile exploded seconds after ignition. “It could have failed because the system is not competent enough to make it work; [faulty engineering], or, there is a strong belief that the U.S. — through cyber methods — has been successful on several occasions in interrupting these sorts of tests and making them fail,” said former Conservative British Foreign Secretary Sir Malcolm Rifkind in an interview with London’s the BBC, in a Sunday interview. The authors note that “in 2014, [then] POTUS Obama ordered that efforts be stepped up to counter North Korea’s missile capabilities with cyber attacks and electronic warfare. North Korea has seen a significant increase in failed launches in the year’s since, though there has been no official claim of the program’s success,” they write. Thank goodness for small favors. “North Korea’s previous attempted missile launch on April 5, 2017, also failed, with the missile crashing into the Sea of Japan,” and well short of its intended target. “Experts have suggested that the U.S. may be carrying out ‘left-of-launch attacks on the missiles using electromagnetic propagation, or cyber attacks, including through [via] infected electronics aboard the weapon, that confuses its command-and-control, or targeting systems,” the authors wrote. I have always considered myself a passionate supporter of Professional Military Education (PME) throughout my career. As a junior officer I was fortunate enough to be posted to the Royal Military College – Duntroon, and be exposed to units such as 1st Armoured Regiment, both of which had a rich culture of professional development, thanks to strong leadership that consistently prioritized not only training, but also education of their staff. When I became a sub-unit commander, I planned to carry on the tradition of developing my staff through unit-based PME sessions. I was soon hit with the challenges I had overlooked by setting such an aspirational goal for my geographically isolated, resource-limited health company. Like many units, we were very short on staff, and we were extremely busy supporting units all over Australia. Our company battle rhythm was often not worth the paper it was written on, as time set aside for our own training and PME was almost always trumped by the higher-priority support tasks of other units. At times I was envious of my combat arms peers who seemed to be able to set their own priorities for their sub-units and have their activities protected; for those working in support functions, their time, space, and priorities are mostly determined by those external to the organization. I was initially stubbornly determined that my company would pursue a weekly PME program covering a breadth of topics, even though at times I might only have an audience of 4–5 people because the rest were allocated to support tasks or away on essential courses. But as the months went past and preparation for major field exercises meant working many weekends and long hours each day for weeks on end, away from families, I felt guilty about taking precious time off staff with PME pursuits. I stopped prioritizing their education and adopted a less consistent, more sporadic approach to PME, primarily aimed at addressing obvious gaps in their immediate knowledge and experience, with no investment in longer-term skillsets needed into the future. It was born out of deadly failure and evolved into an organization that other nations seek to emulate, a command that accounts for a fraction of the Pentagon’s budget but a large measure of how the world sees the U.S. military. This week, U.S. Special Operations Command, headquartered at MacDill Air Force Base in Tampa, turns 30. Created by Congress in the wake of Operation Eagle Claw, the disastrous attempt to rescue American hostages from Iran in 1980, SOCom opened its doors at MacDill on April 16, 1987. It was an attempt to coordinate the work of military services that all did things differently. Up until the terrorist attacks of 9/11, SOCom was a relatively sleepy, train-and equip organization. In 2001, SOCom had about 43,000 people and a budget of about $3 billion. After 9/11, as the role of special operations forces in the fight against jihadis expanded, the command experienced dramatic growth. Today, it has 70,000 people and a budget of more than $10 billion. About 8,700 commandos are serving in about 100 countries, with more than half of them — 4,400 — in the MacDill-based region that’s the responsibility of MacDill-based U.S. Central Command. This includes Afghanistan, Iraq and Syria. Seeing the success of U.S. special operations, representatives from foreign militaries are traveling to Tampa to see how they can recreate such a powerful force. One that offers great bang for the buck. SOCom makes up just 2 percent of U.S. defense budget. The Zero-Day Dilemma: Should Government Disclose Company Cyber Security Gaps? Few topics lend themselves to more polemics than government collection and exploitation of zero-day vulnerabilities, or security flaws in commercial software and hardware not yet disclosed to the vendors, to facilitate intelligence gathering efforts. The choices for intelligence agencies are, in short, to either collect and retain zero-day vulnerabilities to glean crucial intelligence, or, instead, to collect and disclose security flaws to companies so that they may design and distribute patches for them. Weighing these choices involves a number of considerations, both technological and political. But the question remains: does the U.S. intelligence community gathering – but not disclosing – zero-day vulnerabilities contribute to weaker overall cybersecurity? If so, does this negative impact outweigh the benefit such capabilities could present for intelligence collection? Critics of government use of zero-day exploits suggest that by not disclosing vulnerabilities in systems used by U.S. citizens and companies, the government is tacitly accepting their digital insecurity and intentionally leaving them vulnerable to attack by foreign governments, criminals, terrorists, and hacktivists. While the vast majority of cyber attacks involve already known vulnerabilities, the small percentage that leverage zero-day exploits can often be the most harmful. For example, in the 2014 breach of Sony Pictures, North Korean hackers seemingly exploited a zero-day vulnerability that allowed them unfettered access to sensitive data – an incident that ended with the U.S. government imposing punitive sanctions in response.